Hello fellow foodies!! For the last week I have been reading the March episode of Gourmet Traveller (the big Italian issue) as we are going to Italy this September. We have decided on going to Sicily for a week and then to explore the Amalfi Coast. I am so excited to try all of the traditional Sicilian street food which I found out includes arancino (rice balls filled with vegetables or meat and cheese), pane e panelle (chickpea fritters famous in Palermo – capital of Sicily) and fresh brioche filled with fruit, coffee or nougat ice-cream. 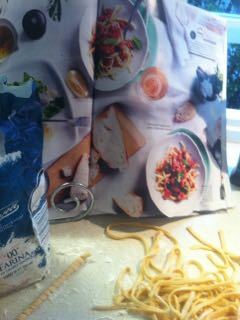 As I was flicking through the magazine a recipe stood out to me. “A tomato-and-almond number hailing from the coast of Sicily”?? Who doesn’t love the sound of that? 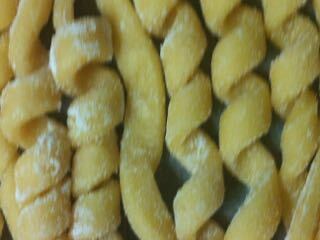 I am also a sucker for handmade pasta, and love to try new methods and different types. So here it is, my attempt at the dish. 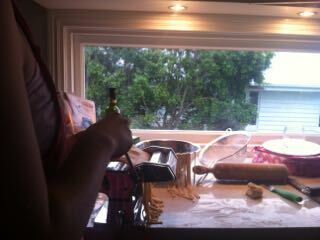 AFTER making the dough, I made the pasta into fettucini using the pasta machine. 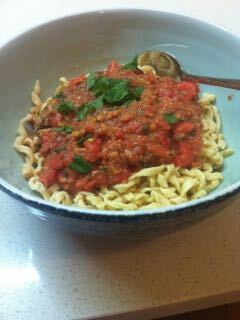 NEXT I rolled the pasta around a skewer to create that spiralled effect of busiata. To make the pesto I smashed fresh basil, oil, garlic and 80g blanched almonds (roasted) in a mortar and pestle to form a paste, then 6 blanched roma tomatoes and seasoned to taste. Garnish with mint leaves. < Previous Hello fellow foodies! You have to have a brioche filled with nougat icecream for me when you are in Sicily!! Yummo! Being born in Ingham where there are still lots of Sicilians and their offspring, I can’t wait to hear more.